The Etosha Pan is a striking place. It is a never-ending flat of white sand and salt baked into the Earth’s crust by the unrelenting desert sun. It is so vast and so flat that one can see the Earth’s curvature from its edge, and the pan itself is visible from space. The pan is neither the largest nor the most unique in geological terms. However, it is one of the few salt pans in the world that hosts amazing wildlife around it and on it, and the rarest among those are the critically endangered black rhinoceroses. 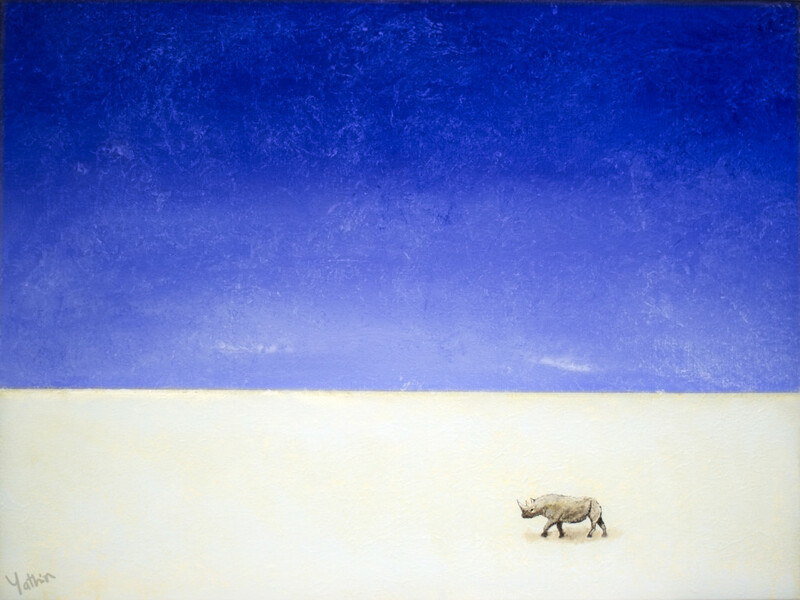 In the countless hours I have spent on the edge of this empty whiteness, I have only seen footprints imprinted on its brittle crust that have betrayed the rhinos’ secretive presence. Midday on the pan’s edge is a wonderful time in Etosha, when the sky blues are at their deepest and the salt flats are at their whitest. On windy days, there’s a sparkling veil of mineral dust in the air that blends into the deep blue hues of the sky. I have seen that surreal landscape many times, and have been amazed every time. Long may rhinos roam there.